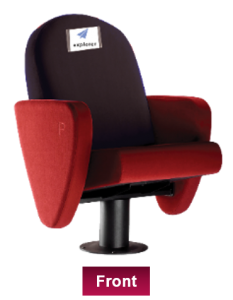 AdReel is simply nonintrusive advertising placed at the rear of cinema seats. 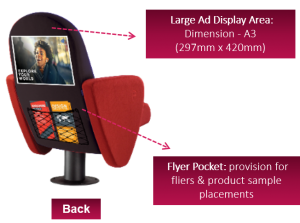 It allows brands target a large number of audiences at-a-go and is a great way to get your ad-message settled in the minds of attentive and captive movie goers. – Brands can leverage the flyer pockets to distribute product samples and fliers as a take-home reminder. – Flyers usually have an average pick up rate of 74%. – Cost effective as it delivers a low CPM. – Target audience cuts across all social strata as well as celebrities. – Builds brand awareness & high message recall. – Campaigns can be planned around relevant films to reach a specific audience group and reduce wastage.